M. Moulay Hafid Elallamy, Minister of Industry, investment, Trade and the Digital Economy, of Morocco, M. Mohamed Boussaid, Minister of Economics and Finance of Morocco and M. Pietro Gorlier, CEO of Magneti Marelli, signed an agreement concerning the installation of a manufacturing facility specialized in automotive components production and which will deliver shock absorbers in the first phase. The industrial zone will be located in Tangier, in the free zone “Tanger Automotive City”, and will cover an area of approximately 20,000 square metres, with the possibility of subsequent expansion. The production capacity, when fully operational, will be approximately 6 million pieces. Production is forecast to begin within 2019, with the progressive employment of approximately 500 workers by 2025. The project will require a global investment of about 37 million euros, and will benefit from the support of the Moroccan State as provided by its automotive industry policy. The activity will initially focus on the production of shock-absorbers for cars and commercial vehicles, with the possible extension of the scope to other products. 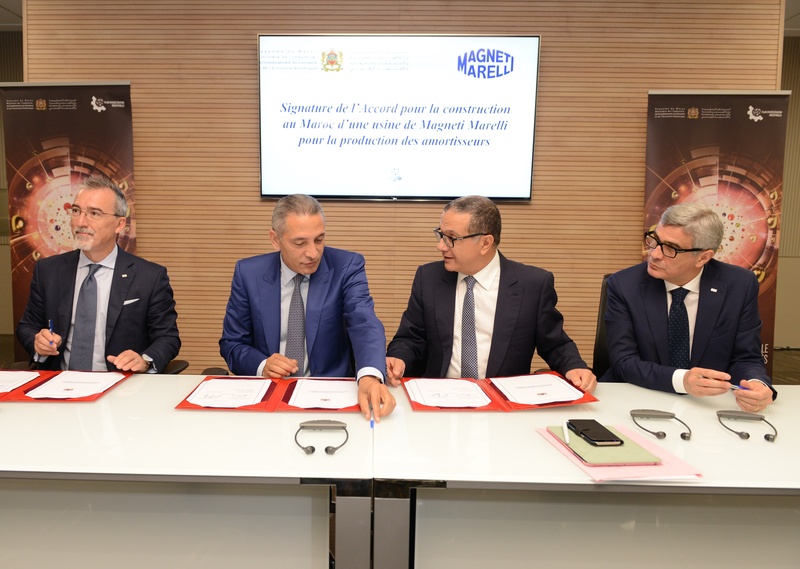 For Magneti Marelli, the localization of production in Morocco follows the logic of supporting locally the industrial sites and the business expansion of a number of important automotive clients in the North Africa region, and marks the opening of a new market in the Maghreb area. M. Elalamy who welcomes this new facility installation, highlighted that “the Magneti Marelli project feeds the manufacturing and sourcing ecosystems in the context of the Industrial Accelerated Plan. With this new project, a new craft is being developed in Morocco, the value chain is getting more complex and the sector is gaining from a successful integration. The Magneti Marelli activity will benefit also to the network of the local suppliers to whom the Tangier factory will be getting its supply. Magneti Marelli designs and produces advanced systems and components for the automotive industry. With 86 production units and 12 R&D centres in 19 countries, approximately 43,000 employees and a turnover of 7.9 billion Euro in 2016, the group supplies all the major carmakers in Europe, North and South America and the Asia Pacific region. The business areas include Electronic Systems, Lighting, Powertrain, Suspension and Shock Absorbing Systems, Exhaust Systems, Aftermarket Parts & Services, Plastic Components and Modules, Motorsport. Magneti Marelli is part of FCA.